All new at Mifa 2018! Innovative programs, a special umbrella space for Europe, a representative in China, a digitized video library: find out all about Mifa’s latest additions! The Annecy International Animation Film Market – from Tuesday June 12 until Friday June 15, 2018 – is expanding again, now revealing the first of its innovations and gems! Market Screenings: the top place for producers, distributors and sellers to present professionals with their latest productions. Shoot the Book Anim’: pitch sessions on books, to promote screen adaptations of French literary works. Demo Sessions: a special showcase where professionals can push their works and technological solutions. Meet the Composer: B2B encounters streamlining contacts between film score composers and European/worldwide directors and producers. 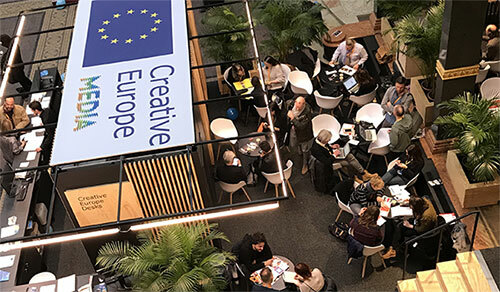 This year for the first time Mifa will host a Creative Europe MEDIA umbrella stand, to enhance and distribute European audiovisual content. An area of more than 100 m², emblematic of the European Commission’s determination to back the animated film industry. Independent European professionals, producers and distributors, check us out on line! Chloé Rui Guo has joined the team of international Mifa representatives and will cover China. An audiovisual consultant and art agent well versed in the French-Chinese market, Chloé Rui Guo also started up her own company, Chloé G. Culture, specialized in consulting and artistic representation. Contact her for your requests. In order to match today’s new uses, the Mifa video library will be accessible on line only. From now on, all films submitted within the 2018 official selection will be viewable during one year. With each Mifa accreditation you get access to the video library. Make the most of this opportunity to promote your projects or productions. To enjoy all these new advantages of the Annecy International Animation Film Market, sign up for accreditation on line and until February 28, 2018 benefit from our early-bird price.